According to Ayurveda, our lifestyle and diet must follow the natural pattern of seasons, this helps us stay in harmony with nature. This is known as Ritucharya in Ayurveda. When the temperature is high, we sweat a lot and the body loses electrolytes and fluids. This causes exhaustion and a feeling of tiredness throughout the day. It's over 40°C and humid. Your first impulse is to grab a soda pop over a glass of ice. This may cool you down temporarily. However, over time you may find your tolerance for hot weather getting less. According to ayurveda, ice-cold foods and beverages disrupt the digestive power called agni. Agni, or digestive fire, can be compared to burning logs. If we dump cold water over burning logs, the fire goes out. According to Ayurveda, our lifestyle and diet must follow the natural pattern of seasons, this helps us stay in harmony with nature. This is known as Ritucharya in Ayurveda. When the temperature is high, we sweat a lot and the body loses electrolytes and fluids. This causes exhaustion and a feeling of tiredness throughout the day. It's over 40°C and humid. Your first impulse is to grab a soda pop over a glass of ice. This may cool you down temporarily. However, over time you may find your tolerance for hot weather getting less. According to ayurveda, ice-cold foods and beverages disrupt the digestive power called agni. Agni, or digestive fire, can be compared to burning logs. If we dump cold water over burning logs, the fire goes out. The same goes for our digestive process. If we ingest ice-cold foods and drinks, our digestive fire becomes weak. The body begins to work harder to digest and absorb nutrients, and Pitta, or the metabolism, gets out of balance. Irritability, intolerance, loose bowels, aggressive behaviour or heartburn are all indications that Pitta has become out of balance. Ice-cold drinks are a quick fix to cool off and a challenging habit to break. The ancient knowledge of ayurveda provides simple solutions to maintain balance during the hot summer without causing side effects. Adequate hydration gives more energy to the body, moisture to the eyes and suppleness to the skin and it helps to eliminate toxins. Many people feel fatigue and would be surprised to find out that the cause may be as simple as dehydration. It is especially important to keep fluids flowing into the body during summer when we tend to perspire more and lose more water. 1. Mango Milkshake: Mix one small cup of fresh mango pulp, one glass of milk, and half a glass of water. Add sugar or powdered jaggery to taste, if required.Grind all of these together and it is ready to serve. 2. Khus Juice: Khus, the grass whose botanical name is Vetiver, known as Lavancha in Sanskrit, has tremendous cooling properties, and is hence, something one must consume in the summer.Place some khus in a mud pot filled with drinking water, so that its essence mixes with the water. This helps in reducing the effects of several summer ailments.These days, khus extract is readily available in the market. It is quite simple to make juice from this extract add 10-15 ml of extract to a glass of water. Consume this liquid once or twice a day and get rid of the evil effects of summer heat like exhaustion. 3. Aam ka panna: It is made using raw mangoes, helps in preventing stroke and keep the body cool. Raw mangoes are rich in vitamin C and iron. Boil the raw mangoes or another way is to roast them. 4. Lemonade: This might be the mostly used & cheapest summer drink in India. Add some mint juice, cumin powder, black salt and ginger for flavor. 5. Buttermilk: Made using yogurt/curd. Mix 1/4 part curd with 3/4 part water, and add a pinch of salt, crushed or grated ginger, mint leaves, coriander leaves, and cumin seeds. Grind all of this together and filter. Consume the filtered liquid. 6. Coconut water: Tender coconut water is filled with natural electrolytes, which helps in relieving summer-related ailments, such as exhaustion and acidity. Tender coconut water goes well with all fruits, when made into a mocktail. You could even make it into popsicles, adding juices from other fruits as well. A mixture of tender coconut water, lemon juice, and salt and sugar to taste is an excellent remedy for exhaustion. 7. Fresh fruit juices: Everyone knows how good fresh fruits and fruit juices are for health, especially in the summer months. You could consume the juice of a single fruit such as sugarcane or a mixture of juices of different fruits like pomegranate, orange, litchi & sweet lime. Grind the fruits with minimal water and no added sugar. By adding less water, we can retain the original sweetness of the fruits, as well as the fiber and other essential nutrients in them. Instead of stocking aerated and preservative-filled drinks in your refrigerator, stock fresh fruits. 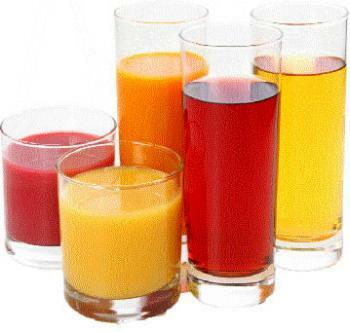 Prepare fruit juice in little quantities when needed and consume immediately. 8. Sandalwood Sharbat: A cooling and thirst quenching drink made with sandalwood powder. Sandalwood powder is easily available. 9. Tamarind drink: Tamarind juice is a wonderful drink to consume during the summer months.To make this juice, soak tamarind in water for 1 hour, post which squeeze and remove the juice from it.To this, add powdered cumin (jeera), cardamom (elachi), and pepper, all in small quantities. Also, add a pinch of salt and powdered jaggery to taste. Filter it, and it is ready to serve. This drink greatly helps in relieving ailments like nausea, bloated stomach, indigestion, and vertigo. 10. Barley water: Add 2 glasses of water and a pinch of salt to 1 tablespoon of barley. Bring the water to a boil or cook in a pressure cooker the barley should be completely cooked. Filter out the liquid and serve. 11. Coriander Juice: Coriander is one of the most cooling spices. Treasured in India and China as well as Europe and North Africa, coriander is highly revered for its many health promoting properties.To a bunch of coriander leaves, add a glass of water, a small piece of ginger, 2-3 peppercorns, 1 teaspoon lemon juice, as well as sugar and salt as needed.Grind all of these together, and filter out the liquid.If needed, add more water to dilute the solution. Over time, as you tailor your diet to the foods and tastes that balance your physiology, your desire for foods which can cause an imbalance, will gradually fade away. Initially, you might feel restricted, but make adjustments in stages, letting your physiology get acclimatized to the changes, and eventually you will feel satisfaction and contentment.